Who is Commonwealth Constable Association? Welcome to the Commonwealth Constable's Association Website. We are a non-profit 501(c)3 organization. We offer memberships to Constable in Pennsylvania as well as associate memberships to non-Constables. Click on the link below to learn more about our various membership packages! Please join us at our next monthly meeting of the Commonwealth Constables Association! At our meetings we provide essential informational updates that help you perform your duties as a Constable, provide updates about your association, and provide an environment for you to network with other Constables from around the state! Not a member?? Not a problem, click on the link below and learn about all the benefits our association has to offer!! Don't delay....JOIN TODAY! HOW BIG IS THE "CCA FAMILY"
Size is 48.8mm x 63.5mm. CCA Announces FREE Range Training Days for CCA Members! "Hes Not Heavy, Hes My Brother!" On November 15,2018 the Commonwealth Constable's Association mailed a Unity Membership Mailer to over 2,000 Constables and Deputy Constables across Pennsylvania. The Unity Membership Program is a FREE membership offered to Constables and Deputy Constables. 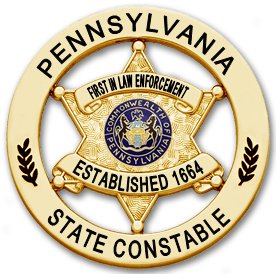 This program is a FIRST and ONLY in Pennsylvania offered by ANY State-Wide Constable Association. The Commonwealth Constable Association is NOW accepting orders for the CCARN! Please click on the button below to be directed to the CCARN Info Page! Additionally, we provide info on used equipment. "ONE Family, ONE Goal, ONE Voice"
Commonwealth Constables Association is proud and honored to announce our Unity Membership Program. CCA is dedicated to uniting Constables across the Commonwealth of Pennsylvania to bring honor and pride to the Office of the Constable. CCA is offering our new Unity Membership, FREE of charge, to any Constable or Deputy Constable. No longer will Constables be forced to pay a fee to have their voice heard and offer their opinions. Our Unity Membership Program will offer several benefits including; an opportunity to share your opinions and address concerns at our meetings, share ideas through our quarterly newsletter, discounts through various vendor programs, purchase CCA license plates, and attend training events at free or little cost. CCA considers all members a part of the CCA family; you are not just a number. We are ONE family, with ONE goal, through ONE voice.​ The time to unite is now, become a member of the CCA free of charge. PA DOT License Plate Available for Members! Commonwealth Constable Association is the FIRST Constable Association in PA to be approved for its own personalized PA Vanity Plate. This plate is ONLY available to members of the Commonwealth Constable Association. Purchase price to be announced. PA registration fees will apply. Join today and take advantage of this awesome official license plate! Please remember PA DOT Regulations- you will be required to maintain membership with our association to utilize the plate; if you drop your membership you must return the license plate.